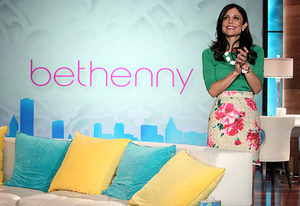 Bethenny Frankel’s new talk show is finally coming to Chicago via WFLD in 2013. It’s a done deal: after a successful six-week test run at a few Fox-owned stations this summer, Bethenny Frankel’s new talk show from Warner Bros. has been cleared on the rest of the group in seventeen markets, including WFLD-TV in Chicago and is now going forward with a national launch in 2013. The former Real Housewives star was tested in New York, Los Angeles, Minneapolis, and three other markets and scored double-digit increases in the key female 25-54 and adult 25-54 demo in each market. Bethenny’s arrival could means curtains for Warner’s other show on the Fox O&Os, Anderson Live. The newly-revamped show in its season premiere week earned only a 1.0 household rating, down 29 percent from a year ago. – In other syndication news, Katie is the top-raked rookie show with a 2.0 rating in the first full week (Sept. 10-14) of the season, ahead of Steve Harvey (1.2), Dish Nation (0.8), and Jeff Probst (0.7). Ricki Lake’s ratings are being reprocessed by Nielsen. Ms. Couric hit a zenith Tuesday with special guest Barbara Streisand, with a 2.3 household rating/7 share, the highest since the show’s premiere on September 10. In Chicago (where it airs at 3 p.m. on ABC-owned WLS-TV), Katie was tops with a 3.0/9. She also won her 3 p.m. time period on WABC in New York, KABC in Los Angeles, and WPVI in Philadelphia. The market were the Streisand episode did best was West Palm Beach, where Katie scored a 5.8/15 at 3 p.m. on ABC affiliate WPBF. Who knew The Chairwoman Of The Board had that many fans in West Palm Beach? After viewing all of the five new talk shows (including Trisha, whose show’s national ratings won’t be available until next week), yours truly ranked Steve Harvey as the best, followed by Trisha Goodard, Ricki Lake, Jeff Probst, and Katie Couric as the worst, whose show was boring and her interview skills very grating. But judging by the ratings, she’ll get time to improve. Or not. -Weekly Chicago Bears ratings watch: Are fans already jumping off the bandwagon? Sunday’s home game between the Bears and the St. Louis Rams drew a 25.4/51 household rating/share, down 10 percent from the season opener against the Colts two weeks ago (28.1/57) and down 23 percent from the week three game from a year ago (though it should be noted the Bears opponent was the Green Bay Packers.) Still, the Rams-Bears game was the most watched program in Chicago last week despite the inconsistent play of Jay “little buddy” Cutler and a game that was as often banal as an episode of Gilligan’s Island (thanks in part to the replacement refs.) Maybe next time Cutler gets out of line, Captain Lovie should him slap him upside his head with his sailor’s hat. The next insufferable three-hour tour with Gilligan at QB comes Monday night with the Dallas Cowboys, which is airing on ESPN and simulcast locally over WGN-TV. Is the axe waiting to swing on Merlin Media? Reports have surfaced about private-equity investment firm GTCR getting ready to pull out of Randy Michaels’ venture after a little over a year, which means the four Merlin Media radio stations – two here in Chicago and one each in New York City and Philadelphia – are on the sales block (Merlin also operates WKQX-LP, a low-power alternative station here in Chicago.) Investors in the venture were stung from the FM News disaster on its New York and Chicago stations, each lasting less than a year and became one of the biggest flops in radio history. Merlin has endured mass layoffs in the last few months, and is seeing the chairman of its advisory board (John Gehron) flee for the exit at the end of this month.